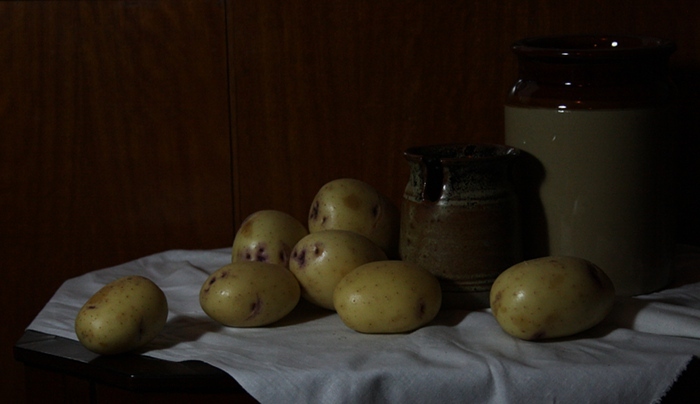 A throwaway line in the course notes suggests having a go at a still life image if we haven’t before. Scary, but nothing ventured nothing gained. First a review of anything relevant I’ve done in the past. 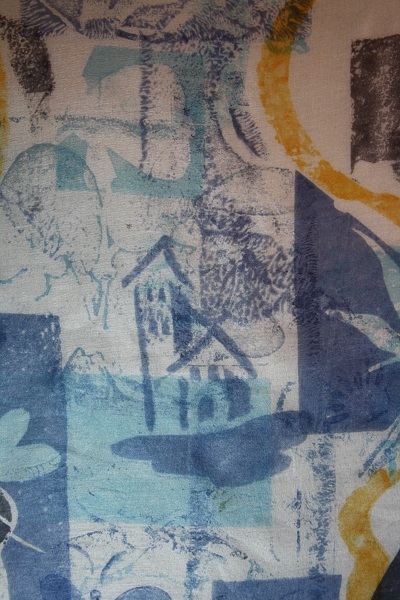 If there is any such thing it could only be as part of Textiles 1: A Creative Approach. 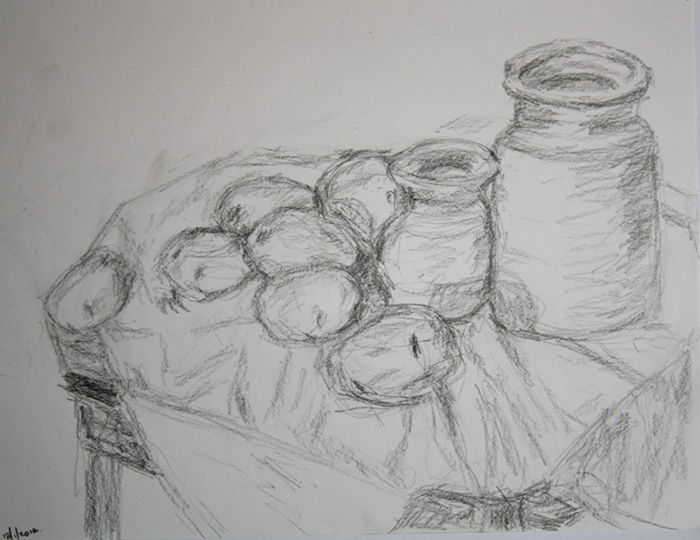 In February 2012 I played around with a painting by Cézanne’s, Still-Life with Apples and Biscuits. That was while doing a section on design development and I somehow tried to combine elements with some sketches of shells and it all went rather strange. If you really want to you can see more here. Not long after that I was playing around trying to get ideas for a class piece. 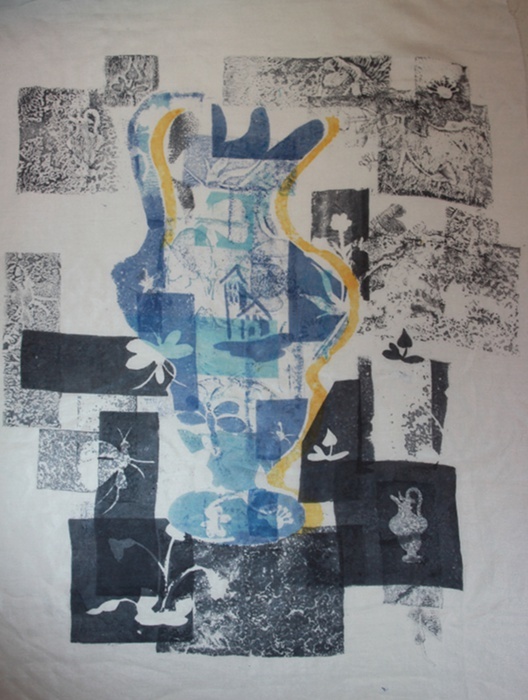 This is based on an old jug, permanently borrowed from my mum, which has a lovely complex shape and interesting little illustrations all over it. You can see the initial sketch here and then scroll down to see the various bits and bobs I did to develop it. 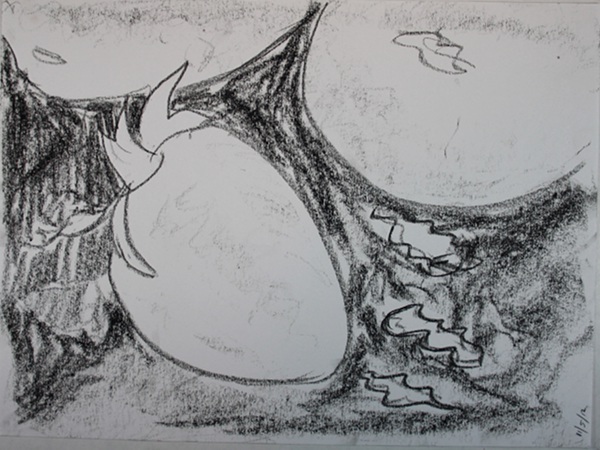 My next attempt had its genesis straight after in the sketchbook on 27-April-2012. 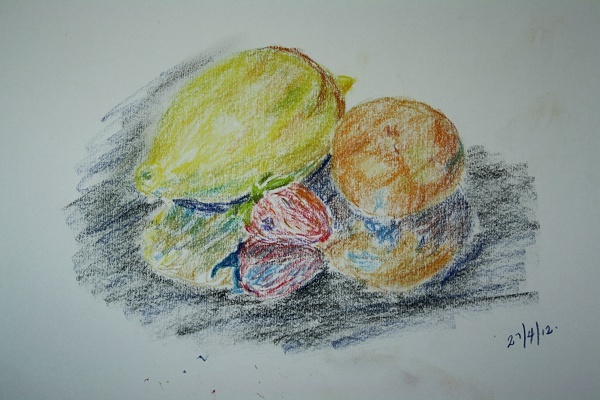 First up was an unsatisfactory sketch of some fruit on a shiny piece of paper. A photograph that I took and manipulated was much more interesting in both colour and texture. 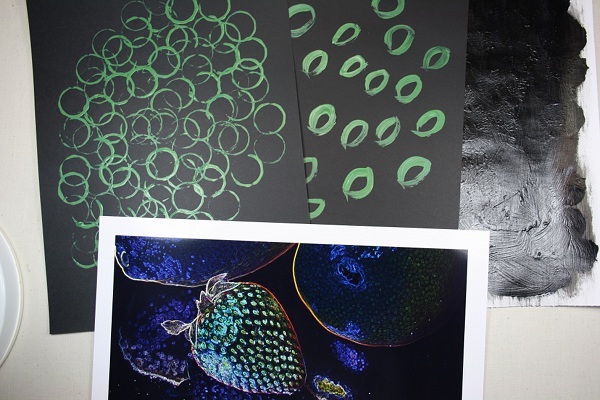 We’re back to unsatisfactory with some dreary experiments meant to explore texture (by now in sketchbook 4). A couple more versions followed here. With colour I found I couldn’t see shapes. In the black and white version I thought maybe I was getting somewhere. 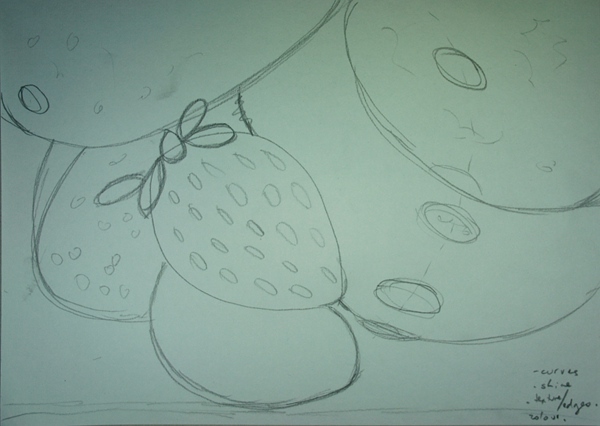 I did a final sketch just before attempting an interpretation in applique for Assignment 3 Project 6. 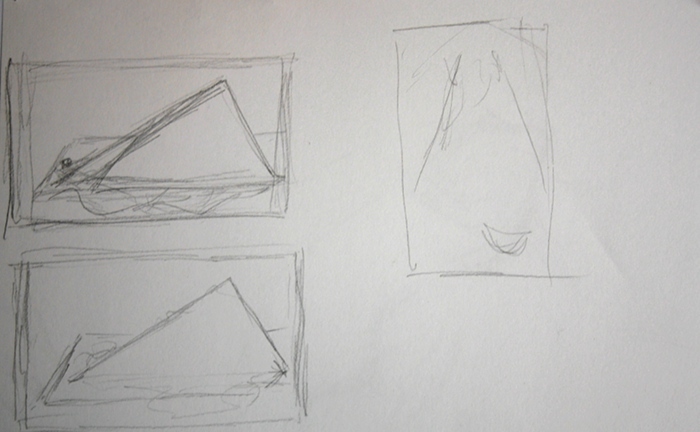 My post (30-Jun-2012) notes that I wanted to keep focus on curves. 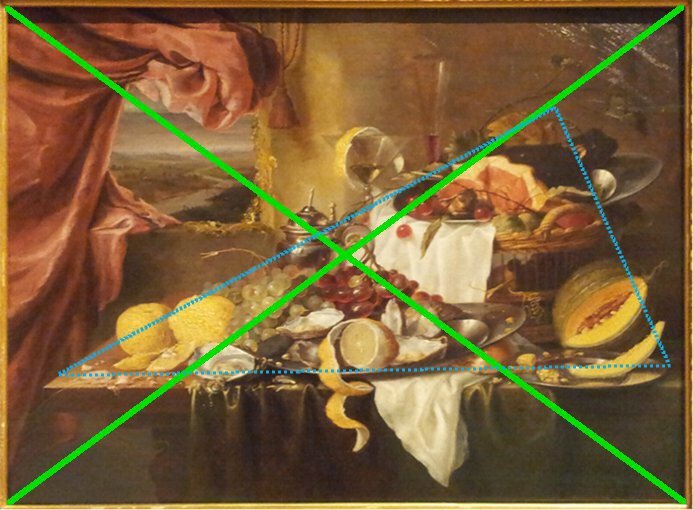 Looking back I think I was trying to follow my preference of finding echoes of shapes/lines/… across an image – see for example comments 13-Jan-2014 discussing Laurens Craen’s still life, although there I saw that the contrast of a few straight edges provided a welcome contrast and interest. My conclusion from all the above is that I want now to focus on the composition as a whole, and within that more variation. Step two was to review some still life works I’ve seen in recent months. I’ve collected quite a few images, but will save the full set for a question in the next project. For now just a brief look back at my recent annotation and analysis of Laurens Craen’s work. Much too complex in the detail of course – and the course notes particularly suggest caution for this first attempt. I looked back at the other Laurens Craen works I’d found (in my files but not here since they’re not my photos). Pretty much all of them are based on a triangular arrangement (although none of the lines straight) on a table top with one corner and part of the front edge exposed. All of the above was written before I started working on the new drawing. 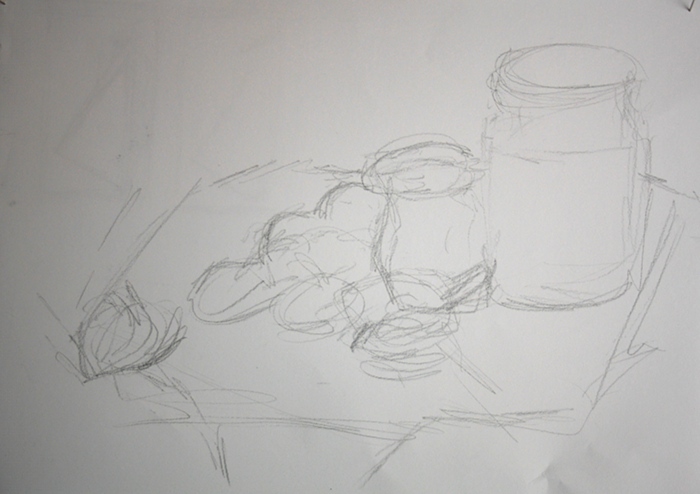 I drew out a very much simplified form, then hunted around the house for items and started arranging. And rearranging. I was hoping with the preparation this would be easier, but it was painful. In the end I remembered this is a learning exercise. A start. This is probably the best I came up with. Potatoes. Not brilliant, and it was only when uploading the photo that I realised I hadn’t got my planned triangle. In morning light the next day I noticed an angle which seemed more interesting, and got out graphite pencils and paper. 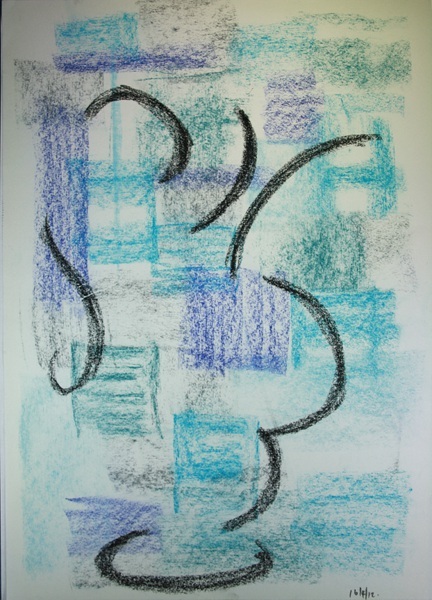 Easing into this I wanted to concentrate on careful observation, shapes and relationships. There was a false start, and a slightly less false version number whatever I’ve got to now. That’s as far as I’ve got. I don’t think it’s worth discussing in detail. I need to keep working at this – not the specific thing but sketchbook work in general. 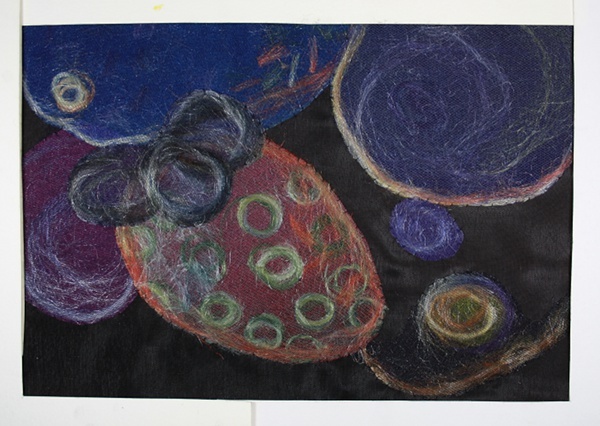 The goal isn’t good drawing or painting as such, but if I can’t create a satisfying composition, if I can only critique others, how can I ever make good textile art? I’d also like to sharpen my observational skills. So this post is recording a start. 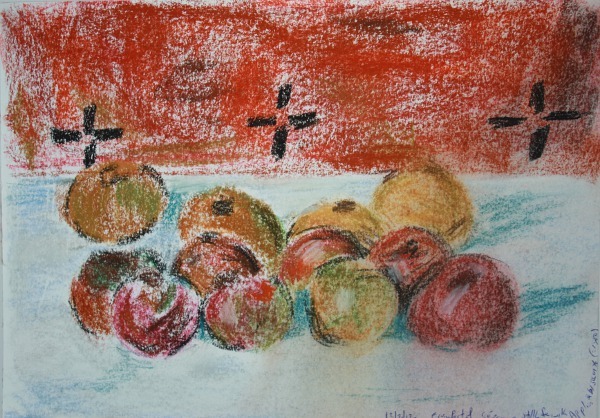 I’m hoping to continue having goes at still life images although not necessarily write about it here. However for a number of reasons I like having a searchable, reviewable record so I’ll quietly add to a new sketchbook page at https://fibresofbeing.wordpress.com/understanding-art-1-western-art/uwa-sketchbook-1/. 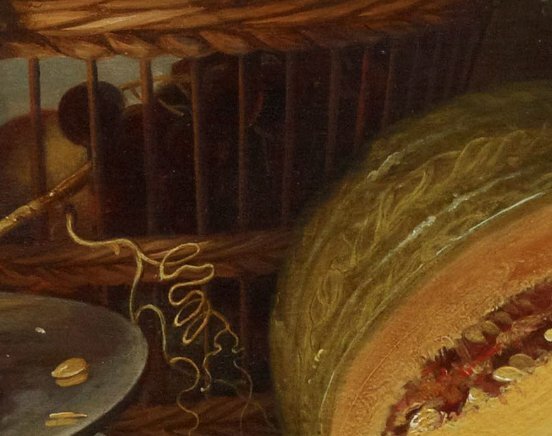 Although still life as an independent genre didn’t begin to flourish until the early 17th century in the Netherlands, elements of its iconography can be seen in earlier works. This unsigned and undated painting in the National Gallery of Victoria shows the saint in his study. He points at a skull on which sits a fly. The skull is a symbol of death, and a special attribute of a number of saints including Jerome. James Hall (2008) provides extensive information about symbols in art, including the use of a skull as an aid to “the contemplation of death as a spiritual exercise [as] recommended by the Jesuits” (Hall, 2008, p. 293). Unexpectedly Hall suggests the fly does not have symbolic meaning. Rather than perhaps a link to putrefaction, Hall suggests a fly serves as a “protective talisman” against insect damage (Hall, 2008, p. 130). On the window sill the hour glass suggests the passing of time, the apple Adam and Eve and the Fall of Man. The crucifixion image seen in the open book could suggest the Resurrection and conquest of death. The quill pen may simply refer to Jerome’s philosophical writing, or as in Pieter Claesz’s Still Life with a Skull and a Writing Quill (1628) “suggest that worldly efforts are ultimately in vain” (The Metropolitan Museum of Art, 2006). 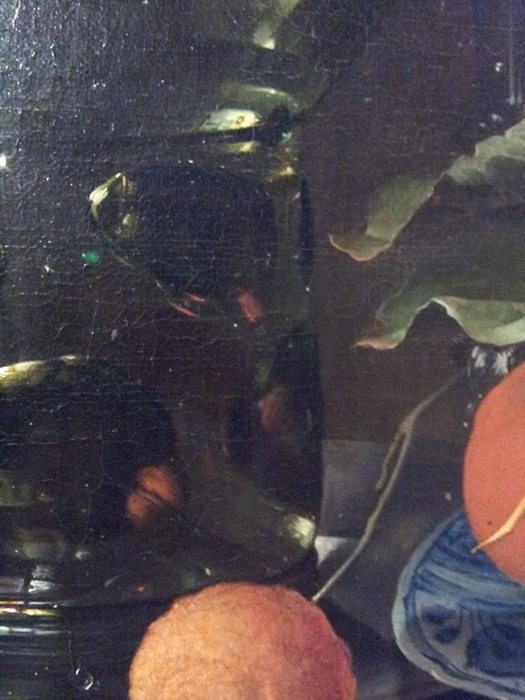 One major sub-category of the still life genre was the vanitas, emphasising the brevity of human life and insignificance of human concerns. An extreme example is on the right from the British Museum. In addition to the skull there are straight trumpets (“blown by angels to announce the last judgement, and at the day of wrath” (Hall, 2008, p. 323), scythes (carried by Death to cut lives short), lit lamps and torches (the brevity of life) and spades (man must toil for his food following the Fall). The rope may refer to Christ’s betrayal, as he was bound by soldiers. The shields across the top are difficult to see, but there could be reference to the fleeting nature of music, the sword which is no protection from death (or wields power only briefly in life), and the bird if a swan could be uttering its last beautiful cry. 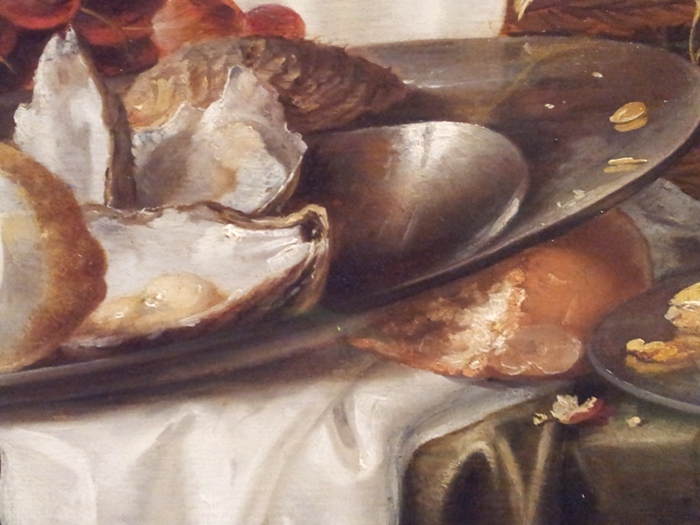 This work by Bernaert is just as full symbolism, but much more decorative and suitable for the wall of the wealthy middle class in the Netherlands. 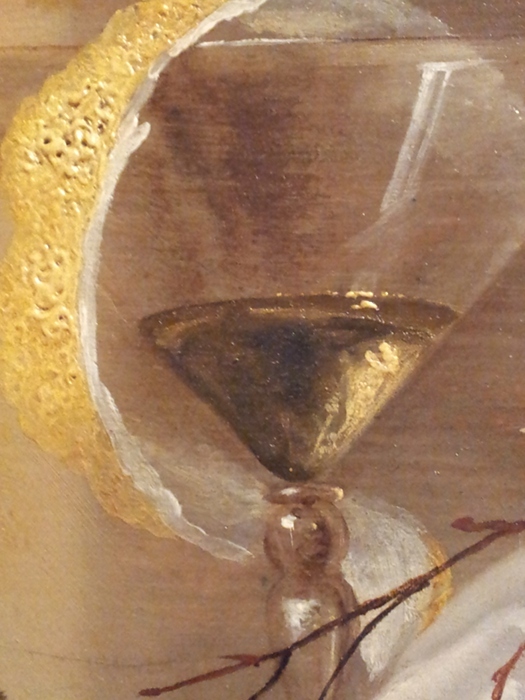 The hour glass is there, also an overturned glass symbolising emptiness. Creative endeavours such as music and writing are transitory as is the beauty of pearls. The important looking papers and the map of the Dutch East Indies reflect possessions and power that will pass. The globes show that all is affected by time, even the heavens above and the earth below. Another sub-category of still life was the pronkstilleven or sumptuous painting. I mentioned this one by Jan Davidsz. 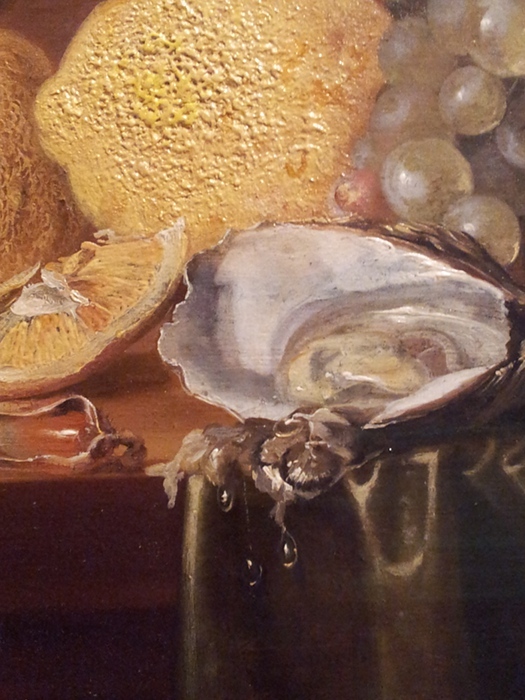 de Heem in my post about visiting the NGV (see 21-July-2013) as I was impressed by the neighbouring cabinet displaying items similar to those in the painting. In paintings like this there is no Christian or moral message. 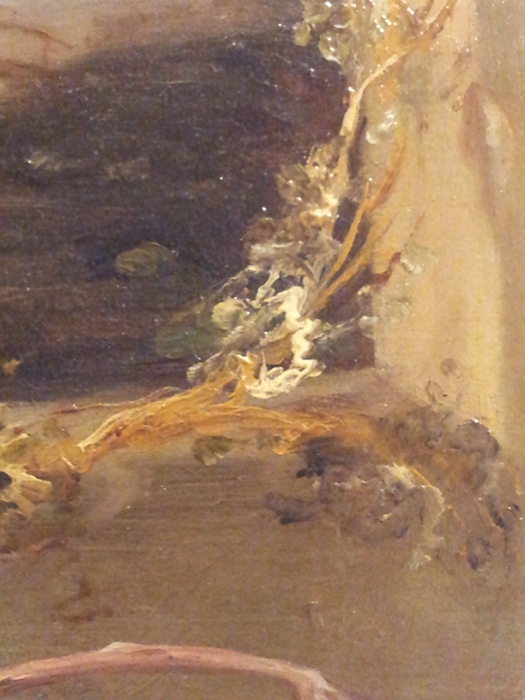 Instead they show the wealth of their owners and the technical virtuosity of the artist. 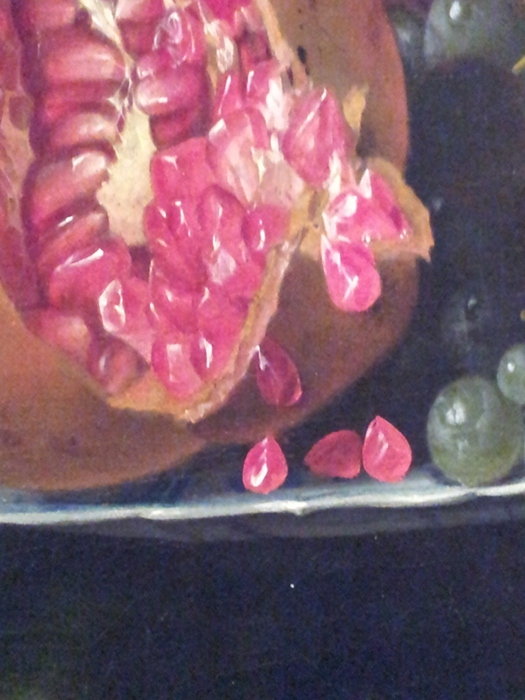 The pomegranate could be a symbol of the Resurrection, or of “the unity of the many under one authority” (Hall, 2008, p. 257), but here it seems more likely to be seen as one part of an abundance of rare fruit. 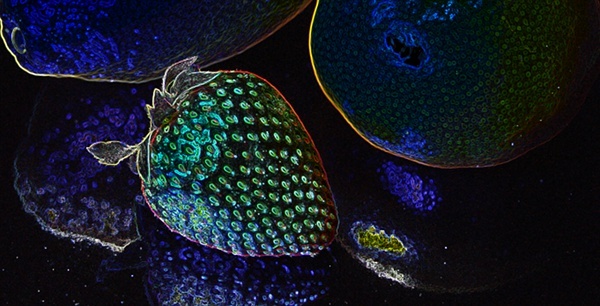 The reflections of light and of fruit in the glass are masterly. 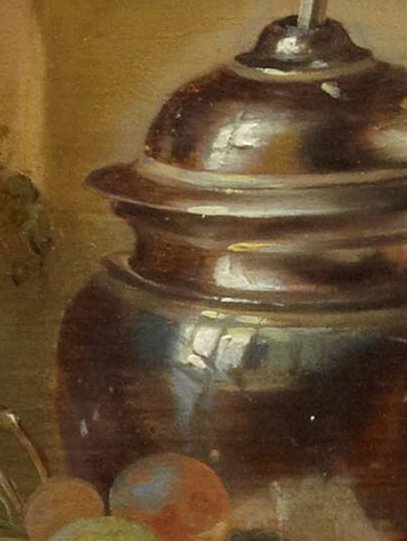 Doing this Research Point I have not had time to consider more modern use of iconography in still life paintings. Audrey Flack uses traditional still life vanitas icons in Marilyn (1977), including an hour glass and a candle (which could have layered meaning given Elton John’s Candle in the Wind of 1973), updated with modern items such as cosmetics and photographs (see http://www.artmuseum.arizona.edu/events/event/audrey-flacks-marilyn-still-life-vanitas-trompe-loeil). 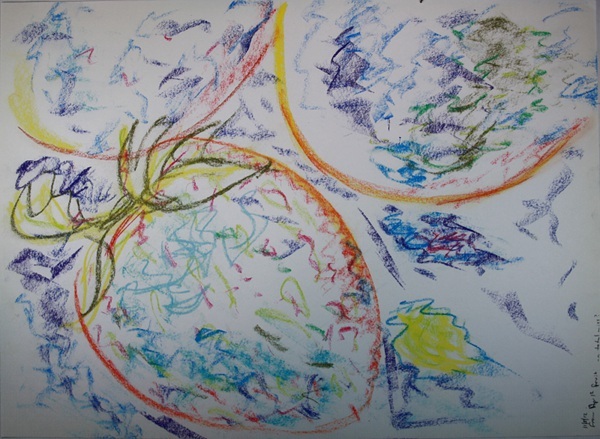 In contrast Stoker (2008) suggests that more modern artists, no longer using traditional Christian iconography, have developed other methods to express transcendence. He describes Rothko’s chapel paintings, maintaining that in viewing them “we will be confronted with our mortality” (Stoker, 2008, p. 94) and proposes that “the arrangement [of the chapel paintings] invokes the tension between the mortal tragic existence of the human being and the transcendent” (Stoker, 2008, p. 98). Stoker, W (2008) “The Rothko Chapel Paintings and the ‘urgency of the transcendent experience’” In International Journal For Philosophy Of Religion, 64 (2), pp. 89-102, Academic Search Alumni Edition, EBSCOhost, viewed 10 January 2014.